JIMGLO Trailers builds a specialized line of trailers, all of which are designed from the ground up to haul cars and solve the trailer complaints of car enthusiasts. While striving to create the most user friendly trailer experience available, we designed the lightest and most innovative car trailers on the market. We are car guys, and all we build are car trailers! Each JIMGLO car trailer is hand crafted using top quality materials, the latest innovation, and years of experience. All this, combined with our engineering know-how, makes the line of JIMGLO car trailers truly extraordinary. Quickest, simplest loading car trailer ever! Simply release one lever, the bed tilts. As you drive on, the bed levels and locks into place. Secure your car and you’re done. In the words of Street Rodder Magazine, the JIMGLO Ego “couldn’t be any easier to load”. 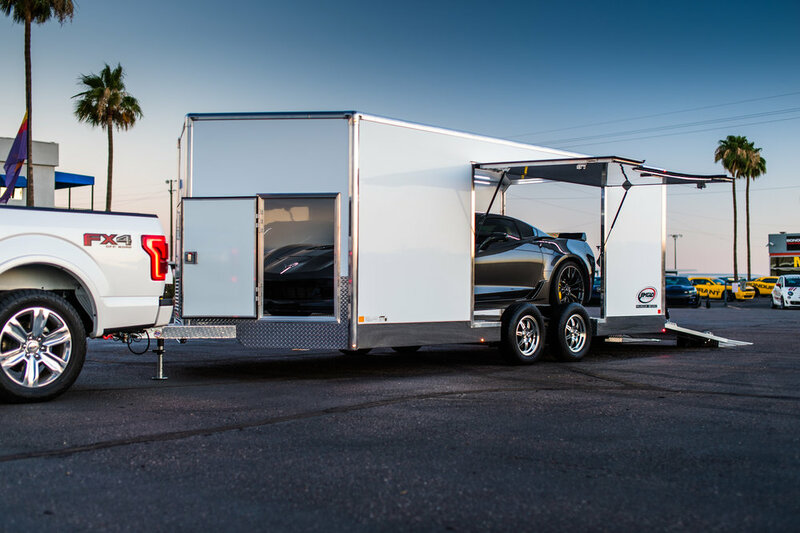 The enclosed sports car trailer created with the sports car enthusiast in mind. The JIMGLO Envy was built to be towed with an SUV, and engineered with a low profile design so it could be parked in a standard garage. We have rethought the entire enclosed car trailer design and created a more user friendly trailer experience. We started with the end in mind and created solutions that make the life of a car enthusiast more enjoyable. Before you buy a car trailer read this informative free guide. Knowledge is power! Arm yourself with information on what to avoid and what to consider before buying a car trailer. You can also contact us online, or by phone at 520.384.4564 or toll-free at 888.5.JIMGLO. and why Ford chose JIMGLO as the exclusive partner. When Ford needed a trailer to transport the Ford GT as part of their Concierge Service they didn’t want to take any chances. Check out the list of requirements to transport Fords most expensive car ever, and why Ford exclusively recommends the JIMGLO Elite. Jimmy, our founder (and the Jim in JIMGLO), was fed up with trying to load his 1969 Camaro drag car onto an ordinary trailer. The Camaro only had 2” of ground clearance, so he set out to build a trailer that would not require the front of the trailer to be jacked up and the use of extra long ramps to load the car. The wheels in his head began to turn and the JIMGLO TiltBed was born. That was in 1988. Many years later and several thousand tilt bed trailers under our belt, the basic concept of the JIMGLO TiltBed remains the same today.